And it isn’t just a place for pre-history, Dunadd, the hill fort which was the seat of power of the Celtic kingdom of Dalriada is only one of many hill forts in the glen. And if that wasn’t enough, the area also has an incredible wealth of early Christian history. Kilmartin Church has an important collection of medieval grave stones and two crosses, one from the 9th or 10th Century. Once, monks inhabited cells, and built chapels on the area’s wind-swept promontories. 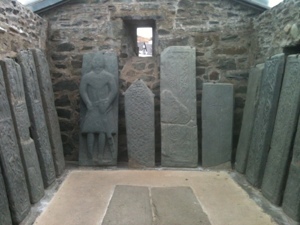 All in, there are 800 historic monuments within a small radius of Kilmartin. Kilmartin is one of my all-time favorite places. The first time I came here around 15 years ago I was totally blown away by the monuments, the wonderful little museum and the fabulous cafe, with a green oak-beamed conservatory. On this visit we walked from the museum, after the kids had ground barley using various methods and taken rubbings of stone carvings, on a 2-mile walk to some of the closest monuments. It took us to four cairns in the linear cemetery (sliding back a trap-door to climb into the grave of one) a field of standing stones, and the famous stone circles of temple wood. We could have made a short detour to some cup and ring marked rocks and even more standing stones but a rebellion in the ranks necessitated a swift return for tea and enormous slices of cake in the Kilmartin Museum cafe. 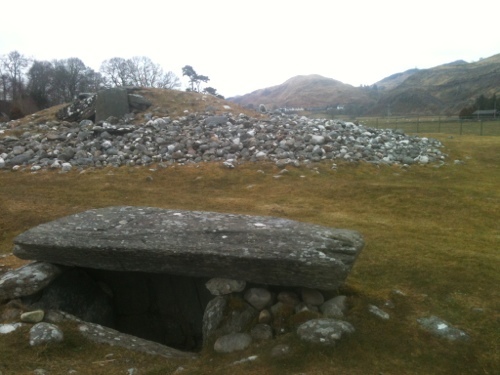 After Kilmartin itself, no-one should miss the hill fort of Dunadd. This volcanic plug, worn down by many ice-ages, still stands out in the floodplain passed by a meander of the river Add. It is a short climb to the top and you pass through the natural fortifications and some of the original walls before emerging on the atmospheric plateau. On a rock at the top is carved a deep footprint, about size 4), a bowl, and a celtic wild boar. It is great to be able to put your own foot (if it fits!) into the place where, more than a thousand years ago, the kings of Dalriada were invested with their power. There is a special atmosphere at Dunadd, the wind is never still, to the south you see the bog of Moine Mhor, which would have covered much more of the glen in the time of the Celts, and it is not hard to imagine that these ancient people are still close by. 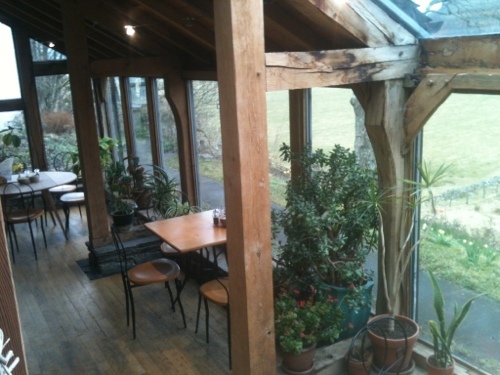 Kilmartin is a place with deep roots and where you feel the past draw very close. The glen has seen many thousands of years of human habitation, and each people has left their mark on the landscape for us to read today in this Glen of Ghosts. If you are looking for accommodation not too far away then the eccentric Lunga Estate has a few self-catering huts which are available by the night (minimum 3 nights). The one we stayed in was fantastic , perched overlooking the sea with amazing views, wood burning stove, and heaving bookshelves. This entry was posted in A great day out, Ruins and History, Things for kids and tagged cup and ring marks, Dalriada, Dunadd, History, Kilmartin Glen, Kilmartin House Museum, Neolithic, Prehistoric monuments, Scotland, standing stones, stone circles by nager. Bookmark the permalink.